Created this piece during a very tough time in my life. My son Jason fell mysteriously ill in early 2010 and eventually had to spend 4 days in the Children's Hospital. Oncologists were involved so it was pretty scare for all of us. Fortunately it turned out to be a particularly nasty viral/bacterial infection and he was fine. I fashioned this one out of the Muspelheim sun during a 48 hour stretch while Jessie stayed at the hospital and I stayed with Ian. It was a great stress release I must admit. I'm very excited about the cool space effects possible from melding Apophysis fractals with 3D geometry. Gorgeous! This sun is about to go nova. That spells doom for all life forms on the planet. Ryan, this image is great, but the pickle jar is better (binary), and many of your viewers have rated it more than this version. If it were to be the actual image, it would be bumped up to No.2 on the top rated list. Please make the binary corona the main one. "Very Cool, but the coronal loops are off"
Ryan, I can't get the download to start while using my bberry browser. Know if there is a setting I need to change? The drop down selection works without issue. This is one of your best, but i have to say that making the star take up a larger portion of the screen for the dual screen takes away from the depth that the single screen has. I have to say I definitely find the Binary Version much more unique. Especially since lately I have been playing Mass Effect 2 and this wallpaper coming out amidst the launch of the game definitely bumped to the top spot on my desktop. Is it possible to get the Binary version in the mobile formats also at some point? I like both versions very much, but I prefer the binary. It's visually provocative and I don't think you've created anything quite like it. I'm glad you gave it a try, and I'm doubly glad (binarily glad?) that it's still available in the Picklejar. Thank you, Ryan, for all your terrific work! I think the binary is a good idea, but the smaller star seems too bright. What do you think? Maybe a different color, or have them interacting with each other? This is more like it! A more faded aurora surrounding the sun and the rocks in the foreground are more detailed! (It's almost like someone is listening to me! LOL! Just kidding Ryan!) Great job! I think you are now beginning to to master your new rendering software. Kudos! Though I liked this small blue star in the multi screen versions, I don't like it in the Binary version. For me, the two stars are too close, and their different colour hues don't fit together. A bit more distance would have been nicer imo. The multi-screen version is already "binary". Let me know if you have any other questions! The pickeljar version is amazing with the second star... any chance to get multi-screen version of the pickejar?????? This one is fierce on dual monitors... I like having something on each side. I have to say that I like the two stars... at first when I was reading everyone's comments I thought it was two big stars. I think the one large star with the one little blue star works well! I have it as my wallpaper now! I'd say, single star for single screens, and binary for duals. It just looks better that way. The binary system on one screen just feels too crowded for some reason. I love the binary version. Whichever you decide to keep in the gallery, the two star version is already on my desktop! No, the stars on one screen don't work the way you have it. "corona dual stars vs. single star"
Ryan, I like the 2 stars for the dual-screen version, but multiple stars on the single screen version seems like too many. Maybe make the blue star bigger and move it to the left. Would also like to see the blue star on its own. Interesting concept design. The difference in sizes between both stars was distracting. Perhaps if they were closer in size? Defitenily will look forward to the next version! Much prefer the single star, 2nd version up in the gallery for the single screen; then again it's nitpicking anyway as they're both still very good :) I'd leave it up to your own preference Ryan, nothing wrong with that! The smaller star was at more of a distance from the larger one. Say for instance, moving it more towards the lower left corner. Just my opinion here. I like the idea, too. but the star alone is just so amazing, the blue one kinda takes away from it. Plus, just the way the "clouds" are around the star just wouldn't logically interact in a binary fashion. No disk, no swirl, ya know? However, still a great idea! LOVE the dual! LOVE the original! Bravo and keep up the great work. "I like the idea, but..."
I like the idea of working in the second star on the single screen, but the way it's currently done in the pickle jar just looks like it's too copy and pasted there. I know you didn't just copy and paste it, Ryan, but for some reason it just doesn't feel like a natural part of the picture to me. I LOVE the current version though and will happily continue to use it. I think it's fine if the second star remains a bonus for those who use the multiple screens. But I agree they are too close together. The Big one is the star (haha so punny I know) of the wallpaper & the blue one should be further away, maybe down and to the left outside of the corona. It would make the smaller one stand out better. I like the second star, I really do. But I think it looks a bit odd over the top of the main star. I'll be keeping the single start for a while yet. While I do agree with the others that you should update the 2003 binary, i personally think that both corona single versions are well perceived by the eye in their own way. I think that a binary system should be in a new wallpaper. "I couldn't agree more with Will!" I love both versions of this background, though I prefer the binary arrangement. I'm very excited to see how much effort you've put into Corona -- it has turned out to be such a fascinating project to see develop. "I like the idea of the binary, but..."
as others have said, it's too close in the single-screen version. If the blue star was further away, maybe barely on the screen, I might prefer it to the single star version. I do love the way you've played with Corona, though. I like having the different versions. +1 on moving the blue star away from the orange one, so they don't obstruct each other. Also, I would think about making the blue one a bit larger and the other one a bit smaller. They don't need to be equal size, but a bit more "balanced". 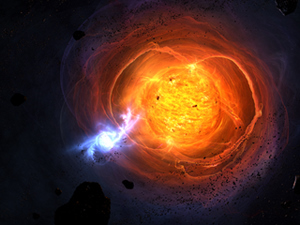 Both are quite beautiful, and indeed the contrast of that blue star is very striking. However, I feel that it is a bit of a distraction from the glory of the large star's corona. Ultimately, I will be happy with either as the are both sweet. I love the binary star image. But I agree with some of the others, the pickle jar version does seem a little too close. The binary is too busy. I agree with Ryan, the original is the stronger of the two. "Definitely Binary with a few more changes"
+1 on that it should be an extremely high density one that is pulling some matter away from the first. I think these two changes would make this a very cool render indeed! In terms of PC versions, try putting the blue star a bit further away. There is a nice amount of space on the bottom left. Matt's idea of exchange of matter should work really well. "The original is the best one"
The binary version just doesn't seems as "real" as the original. It seems like the blue star has been thrown into the image (sorry to say). "i like the blue star, but..."
...if they're that close together, i'd rather see their coronas "eating" each other...gravity effects and all. I really like this concept but I don't like that the blue star is front of the Corona star. I think it would look much better if you move the blue star to the far left and maybe move the Corona star a bit to the right so they both occupy their own space. Thanks for the feedback. I prefer the original myself, which is why I put the "binary" version in the Pickle Jar. Too cluttered with the new star in there. My 2 cents. This is one awesome image by the way. I have this wallpaper on both my triple screen at work and my home laptop. While i must say on the triple the blue star looks great, I believe that putting the smaller star right in front of the larger one takes away from the original magnificence of the picture. Having both stars on one wallpaper/one screen also looks great. You must be running a higher Res than I do, 1080p. It is smaller, but still looks alright. And 2 Attempts to get my monitor to look as cool as the Dual & Tri screens. Thank you, I already tried that. I've posted a 480 x 800 version. Thanks for the heads up! A work mate just came up behind me and said "Woah dude, is that from that *ing hubble telescope, man? Or what?!" - always a good sign. Would love to see the blue star from the tri screen on its own. WOW, I want a triple screen setup just so i can use this wallpaper forever! PS Ryan, any chance on a computer monitor bailout? Come on, everyone else is doing it! Ryan, I think you've out done yourself this time! The triple widescreen, while unusable on my single screen, makes me want to go get a loan to get the monitors to use it in all its glory. Well done! The dual widescreen version is incredible and, IMO, better than the single screen. I rarely rate things as 9 or 10 (don't want to dilute the meaning of those), but this gets a 10. Some of your finest work, IMO. Thank you. I liked Corona before, but the dual screen takes the cake! That star is GORGEOUS on the triple screen view! Also I love that little blue planet off to the left, with the star's radiation reflecting off of it's atmosphere. "If you replace the star in Muspelheim..."
Can you please remove the Canyon so that we can see more of the sky? Still, it was a great image don't get me wrong! Wow this is very great, the polar caps and forces are a nice touch. I have always liked your space themes the most and this one is no exception. "I don't really need 3 monitors..."
Why do you keep tempting me like this?! I actually took the 7680 tri screen & photo-shopped the white dwarf? star into it's own wallpaper. Not quite as cool, but still an interesting wallpaper. Since you've already done most of the work... Binary is one of my favorites! In fact, experimenting with any of the dual/tri screens on a single monitor produces some pretty spectacular effects. It's awesome that every single little part of the piece stands on it's own. "Triscreen on Single Monitor "
To all you single monitor people like me out there, even though you're obviously behind the times by several centuries, you can get a taste of the glory by setting the 7680 version to "tile." It actually makes for a pretty cool wallpaper of it's own. And show off some closer up, updated scorched pitted rocks rather than just the silhouettes far in the background. Like having the little man next to part of an arched pillar. The first render of Corna was amazing and this is just as amazing, the fractal ribbons in the sun give a 3d affect and are pretty cool. Awesome job as always Ryan. That will be an excellent improvement. I suggest removing the cave framing as well so as not to obstruct the new star. 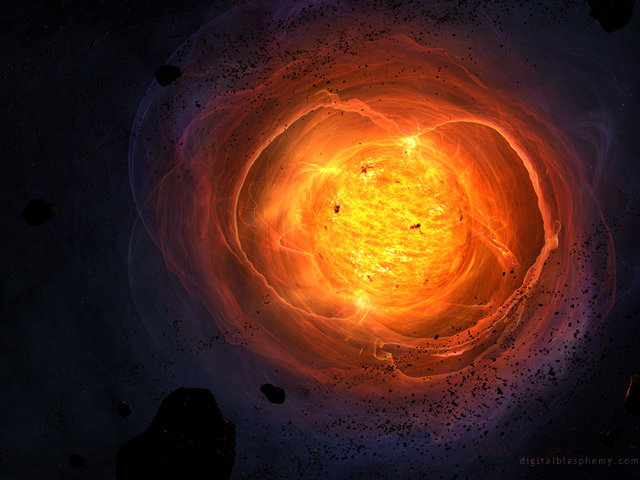 This actually is the star from "Muspelheim", with some added work. I intend to add it back into that scene shortly. Man I, wish this was the star of the muspelheim wallpaper, This one looks way more badass. Yup, the title says it all. The texture update blends in so much better with the corona. It's gone from really good to amazing. Changing the vote to a ten. The added detail only makes it better! I really like this one! ist one of the best wallpapers you ever made. This is one of my new favs! Good job! Nice quick Submissions! I do like the Star 2.0, looks more fluid & on fire than the original. Very cool! Dethroned Poseidon's Playground... at least for a little while. Going SCUBA diving in Bonaire in early March & it's perfect for that. "Mush better than the last submission!" Man, this is awesome! Love it! The colors are fantastic and it looks amazing! I'm a believer again! I love Ryans Planetary work. This is one of the best. A total 10. This is it! I knew you were discontented with Muspelheim... admit it. As a musician I can understand when your "baby" doesn't quite turn out. I'm glad you didn't give up and move along. As others have stated, this is far superior to your previous work. Albeit Muspel still had mad potential, it cannot compete with this concept which centers the viewer to the majesty of the star. Definitely top notch stuff here. The colors combos are simply ridiculuous, in the best of ways. "It's just, umm, like -- Wow!" As you can see, I'm speechless. I love this image -- it's one of the few 10s I've given -- and I think I'd still love it even if your space images weren't my favorites. This goes straight to my desktop. Wonderful job, Ryan! As for the "it's not realistic enough" comments, realistic representation is important to a point, but if realism was all we cared about, we'd cancel our DB memberships and just download the NatGeo Picture of the Day and the Astronomy POD. Your artistic interpretation is what makes your work so compelling. Keep up the great work! Like it a lot, the center of the sun is much better looking then before. ...for the dual widescreen. This is great! Thanks for the bevy of great images of late! I love how Ian's comment is almost a copy and paste of my original lol. Anyway, the updated image adds a lot of depth to the star. Thanks so much for the speedy fix! P.S. I'm building a new rig with a dual monitor set-up and can't wait to add the finishing touch to it by slapping on one of your amazing dual screen wallpapers! Once again, an incredible work! Thanks, Ryan, and I'm glad to know your son is doing better. I love the fractal look and the rocks that seem to float in space. Beautiful wallpaper. Thanks Ryan keep up the good work. Love this very much! Glad the kid is doing better. I had not seen the last posts from 1/20 and 1/21. My RSS reader did not pick them up for some reason. I'm very glad to hear Jason's ok, though. I hope he is fully recovered soon. That's a very cool render! It combines realistic space elements with abstracts, and I think I like this type of pictures most. "Looks like a new star"
Very nearly perfect. You'll probably tweak it a little here and there. Some others voiced some nitpicks about the star's resolution, and I would agree. It seems a litle grainy while the Corona seems a lot more organic. I also thought the large pieces of debris were a little grainy as well. These are only observations and suggestions, I'm sure you realize. It is still fantastic enough to earn a 'nine' from me and it sits proudly on my desktop. I'm thrilled to hear your son is doing better. 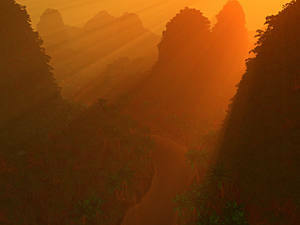 Any word on when we can expect you to start producing artwork made in Terragen? Nice addition Ryan. Still looking foward to an epic planetscape. Preferabbly in the green & yellow hues. Anyways. Nice Job! It is very pretty, although like another user stated the sun's surface's resolution is kinda cruddy. What a sweet blend of the representative and the abstract. Love it! 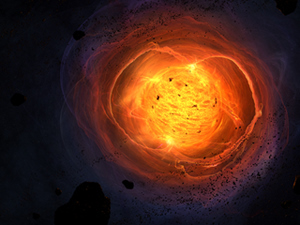 Although I found Muspelheim disappointing I thought the background star image had a lot of promise, and I was hoping you'd do something like this as a result. This is much more to my taste. I look forward to the multi-display version. I would'nt change a thing on this one, perfect. Its not often I get the chance to use that word but...it really is. My eyes are so fixed on the "crisp fractal flames" as Ian said below. If you could sharpen up the stars surface to a glittering pin sharpness then I wont be going to work...i'll be staring at my monitor all day drinking it in!!! Firstly I agree with what Ian said about the low-res looking surface on the sun. Other then that it looks awesome! As for Jason I wish again for a speedy recovery and endless joy with his Lego (I'm 18 and still love making models)! "My favourite space wallpaper ever"
Wow. I absolutely adore the use of colour here, and the way the outer layers seem so fragile. I'm usually into scenery rather than the space scenes, but this is just something special. Thanks! ...the texture on the surface of the star looks very flat and low-res. It stands out against crisp fractal flames, but if not for that one issue, it would most definitely be my new desktop. Wow, this is truly impressive. I can see this becoming a bit of an icon for DB. I like the way you have combined a space scene with a fractal, very inspiring. Wow! This one is way better! 10 out of 10! "I know I say "Awesome" a lot, but man.....Awesome!" I love all the detail in this. Maybe you could do a pickle jar version of Muspelheim with this star? I love this one. However, I have one thing that bothers me. The texture of the star appears stretched in the center. It also seems a bit low res or flat. I love the plasma you've created, it just seems to make the sun's texture stand out is all. That's just me being to critical though. I love this wallpaper and it looks great on my desktop! Good to hear Jason is back home, hope you get some good news soon. To be honest I loved the little blue man and was using that one as my wallpaper but I DO prefer this one. I think this s a great re-work. art is never done. this is much improved. I love it! I commented on the last picture that I thought the coronal halo wasn't quite right, and in my head I was picturing something exactly like this. I really like this one, it looks amazing. Terrific idea, I love the star!!! Thank goodness it's in a wallpaper of its own. hey Ryan, thanks for coming out with another one so soon after your family issue. i like this one, but have one reservation in that i'd be hard pressed to believe that a star's corona actually looks like that. not completely realistic, but then again, its your imagination! i do really like how the rocks/debris seem to be swirling and circulating the star though. good work! Simply amazing! Makes me think of Avatar! Would love to a world like that illustrated by you! Looking forward to the triple screen! Another reason it won't make it to my desktop is because Poseidon's Playground is just that beautiful of a wallpaper, I can't bear to take it off. I think that's your most amazing work thus far, even overtaking my other favorite, Song of the Sky. Muspelheim was OK, but I like this one better. Probably still won't use it on my desktop, as it's too bright, but I do like it. The fractals on the star look awesome, almost like it's from a really cool sci-fi video game, like Half-Life. Is this the sun from Muspelheim without a planetary landscape in the foreground? This looks pretty nice. Holy Smokes! This one's gorgeous! I see blue!!! Not bad I like this one. Thanks! I love the stuff surrounding the sun, it just looks flat out cool. The sun itself is however lacking in detail at high resolutions, and I think the large rock in the lower left looks a little out of place.